In 1917, this building was the home of the Legal Defense Fund office of the Industrial Workers of the World--a union of unskilled workers whose vigorous tactics made them both feared and derided as the "Wobblies." Of the many Spokane offices of the IWW in the early 1900s, the only building that is still standing is right here. 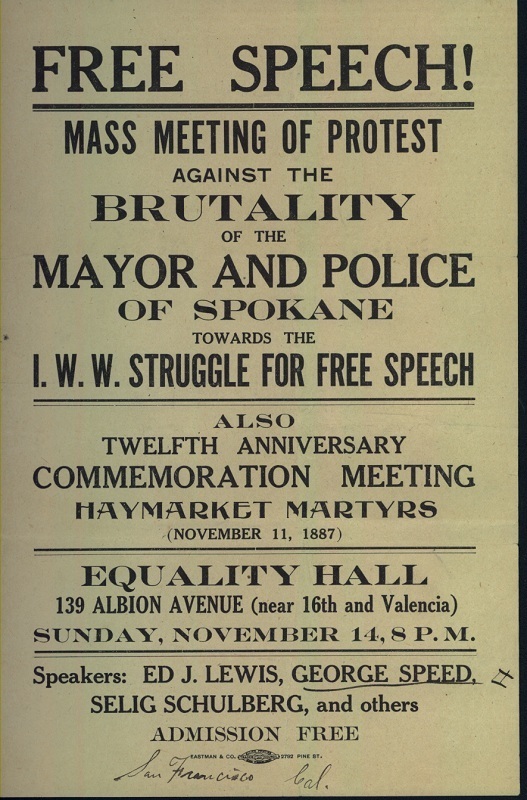 The Wobblies first made a mark on Spokane in 1909, when a labor action they sponsored led to the "Free Speech Fight." As tempers flared between militant workers and area industrialists, the City of Spokane banned public speaking in 1909, hoping to stifle the various worker's movements. 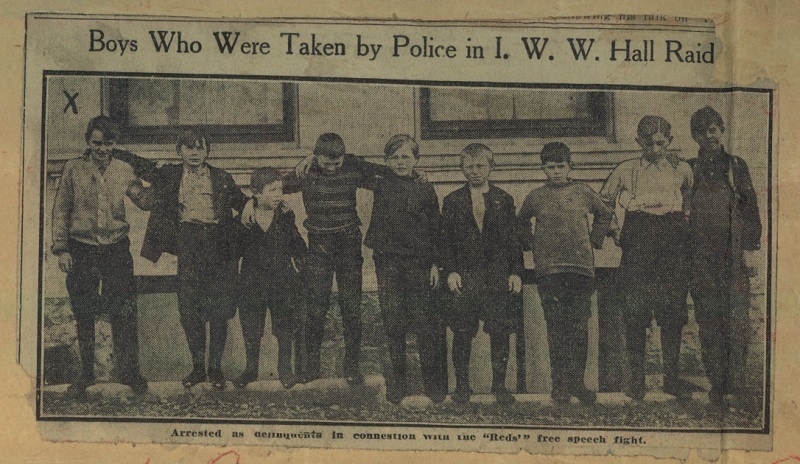 Within a few weeks of the new law, over 500 members of the Industrial Workers of the World (IWW) were arrested as they protested the unpopular law until the Spokane Jail was overfilled with the protesters. 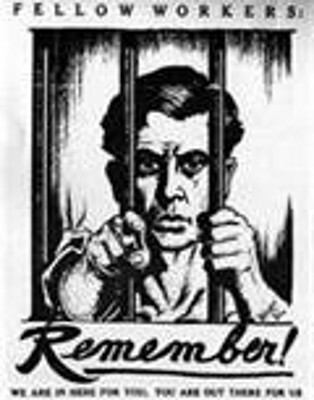 The word was sent out by IWW leader James Rowan that all available supporters should report to Spokane to, as the IWW newsletter read, "Come Fill the Jail in Spokane." A picture of a jailed member on a poster is captioned, "Jailed: We are in here for you; you are out there for us." In a symbolic gesture of solidarity and protest, hundreds of Wobblies arrived in Spokane in order to violate the ordinance for the sole purpose of getting arrested. The highly contested ordinance was overturned in March, 1910. 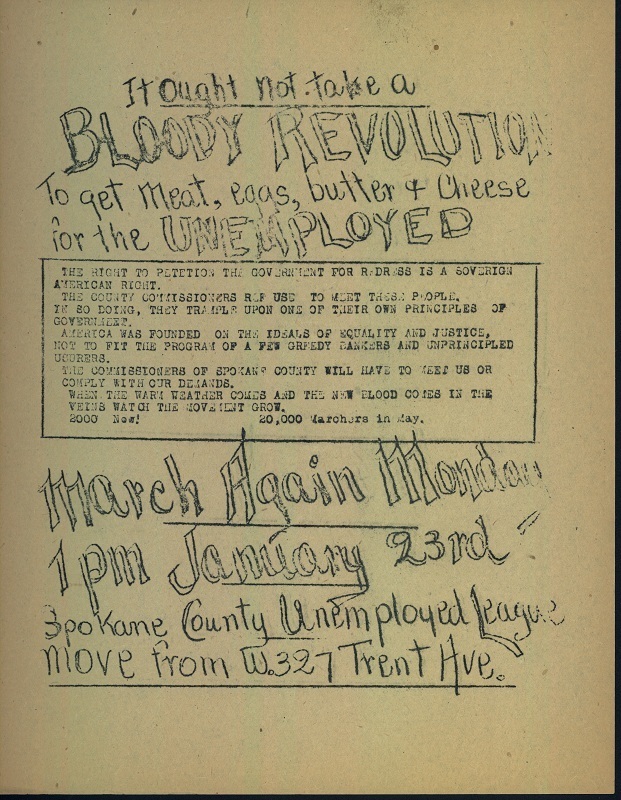 Over the next eight years, the Spokane IWW continued to expand its influence. In August of 1917, Rowan threatened a strike in all the state's industries, which was when the IWW discovered the breaking point of the local government. This prompted a brief military occupation of Spokane by the National Guard and a declaration of martial law by Governor Ernest Lister on August 17th. The main target of this ordinance was members of the Industrial Workers of the World and it was used as a means to prevent any further organization of mill workers and migrant harvest laborers who were striking for eight hour days and clean camp conditions. As a result of the IWW's refusal to comply, all three IWW halls in Spokane were raided, their documents seized and 94 members arrested. When martial law was declared in 1917, the National Guard, under command of the US War Department, arrested anybody with a red card (IWW membership card) and arrested anybody engaged in "seditious activity", such as organizing workers. Although public speaking was banned, as a show of who the ordinance was geared toward, members of the patriotic organization, the Volunteers of America were still allowed to continue to speak freely. Elizabeth Gurley Flynn: Elizabeth Gurley Flynn was a prominent activist of social causes and worker's movements who helped fight for workers in Spokane, Butte and Missoula. Image courtesy of the Industrial Workers of the World. 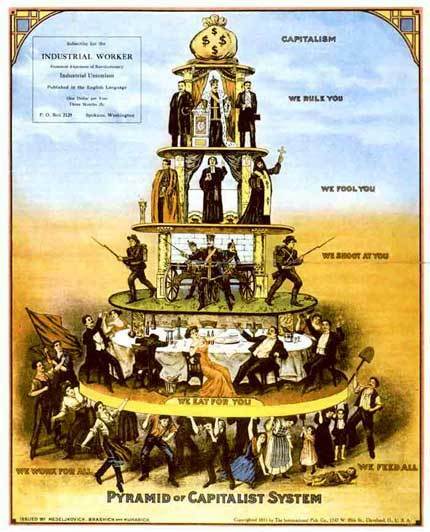 Industrial Workers of the World Poster: A poster printed in Spokane by the IWW newsletter depicting the American class hierarchy/system. Image courtesy of the Industrial Workers of the World. Workers Getting Ready to Travel to Spokane: A group of IWW members and supporters about to travel to Spokane in order to help "Fill the jail", for the reason of protesting the no public speaking law. A sign of solidarity. Image courtesy of the Industrial Workers of the World. Labor leader and organizer James Rowan. 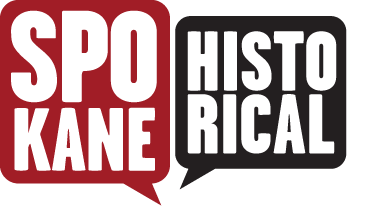 : James Rowan was an IWW member, leader and organizer in Spokane during the free speech fights and the martial law occupation. It was Rowan who sent out the call for IWW memebrs to report to Spokane in protest. Image courtesy of Industrial Workers of the World. "Come Fill the Jails" Poster: This poster was printed on the IWW's Spokane presses in order to notify members elsewhere about the Free Speech Fight protests. James Rowan gave the call to "Come Fill the Jails" in Spokane. Image courtesy of the Industrial Workers of the World. The Little Red Song Book: The famous booklet was full of the IWW's "fighting songs" used to inspire those involved with the radical worker's movements in the early 1900s. Image courtesy of the Industrial Workers of the World. Autopsy Photos of Assassinated IWW Member Wesley Everest: Everest was killed (beaten, hanged and shot) in Centralia, Washington by anti-IWW activists. The IWW newsletter published this picture of his autopsy in 1919. Image courtesy of the Industrial Workers of the World. 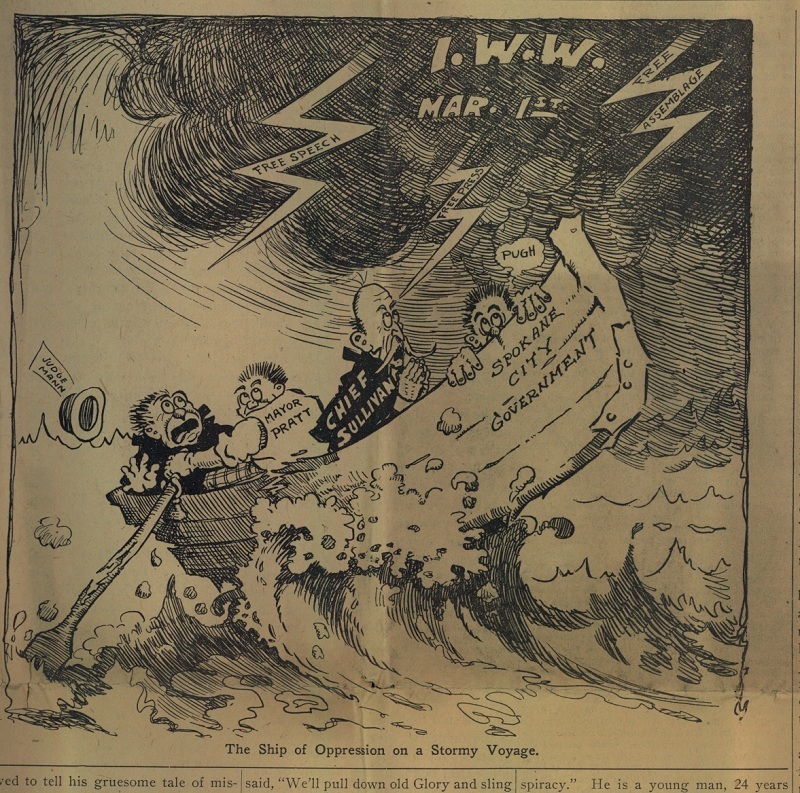 Robert Lambeth, “1917: IWW Offices Raided & Martial Law Declared,” Spokane Historical, accessed April 21, 2019, https://spokanehistorical.org/items/show/291. Spokesman-Review, August 19, 1917. http://news.google.com/newspapers?nid=0klj8wIChNAC&dat=19170819&printsec=frontpage&hl=en. John Duda, Wanted: Men to Fill the Jails of Spokane, Chicago, IL: Charles H. Kerr Publications: 2009.